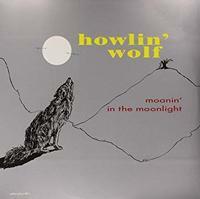 Howlin' Wolf at his finest! 60th Anniversary Edition! Chester Arthur Burnett, better known to blues music fans as Howlin' Wolf, remains one of the essential exponents of the electric blues. Released on the Chess label in 1959, Moanin' In The Moonlight debuts Wolf's sound — a fierce growl mixed with explosive playing by guitar geniuses Willie Johnson and Hubert Sumlin — was huge and eerie, and this compliation taught the Rolling Stones, Eric Clapton and the rest of England the ways of the blues. Howlin' Wolf performed throughout the South in the 1930s and 1940s, having reportedly learned to play guitar and harmonica from legendary bluesman Charlie Patton and Sonny Boy Williamson, respectively. He was discovered in the early 1950s by future Sun Records founder Sam Phillips, who recorded Wolf's early sides, some of which he licensed to Chess. Wolf eventually relocated to Chicago and began recording for Chess directly. Like many LPs of the period, Moanin' In The Moonlight includes tracks stretching back several years, including a trio of numbers"Moanin' at Midnight," "How Many More Years" and "All Night Boogie"recorded in Memphis in the early '50s with Sam Phillips. The album's nine remaining songs were recorded after Wolf's move to Chicago and produced either by label owners Leonard and Phil Chess, or by staff musician/songwriter Willie Dixon. Moanin' In The Moonlight features four songs that had been hits on Billboard's national R&B charts: "Moanin' at Midnight", "How Many More Years," "Smokestack Lightning" and "I Asked for Water (She Gave Me Gasoline)."